Front Line Identifiers (FLI) are a unique group of people. 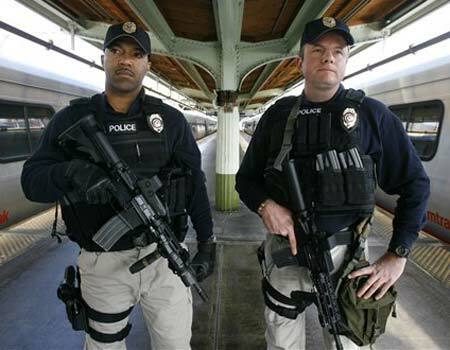 They include law enforcement, nurses, teachers, social workers – and now, Amtrak Employees. Truly, transportation workers interact with thousands of travelers every day, so they are in a unique position to observe and report situations that don’t seem right. Recently, Amtrak joined forces with federal agencies to train over 8,000 frontline transportation employees and Amtrak Police Department officers to identify and recognize indicators of human trafficking, as well as how to report suspected cases of human trafficking. The effort was unveiled by Secretary of Homeland Security Janet Napolitano, Secretary of Transportation Ray LaHood and Amtrak President and Chief Executive Officer Joseph Boardman. Under the program, Amtrak will use training and awareness materials developed by DHS and DOT as part of the DHS Blue Campaign to educate employees on potential indicators of human trafficking and how to identify potential victims. Of course, human trafficking is a crime linked to other criminal enterprises. In just the past few months investigations by Immigration and Customs Enforcement (ICE) and partners in law enforcement have led to convictions of several traffickers. One case in Virginia, in which a former leader of the MS-13 street gang plead guilty for his role in a juvenile prostitution ring; and a case in Philadelphia where a man was sentenced to life in prison for smuggling young immigrants into the U.S. and forcing them to work for little or no pay. In March of this year, President Obama directed his Administration to redouble efforts to eliminate human trafficking. In a recent address to the Clinton Global Initiative, President Obama reaffirmed America’s commitment to leading the global movement against human trafficking, calling it one of the great human rights causes of our time, and announced a number of new initiatives. This new initiative by Amtrak can save lives. In just the past few months, investigations by Immigration and Customs Enforcement and other law enforcement professionals have led to convictions of several traffickers, including a case in Virginia, where a former leader of the MS-13 street gang plead guilty for his role in a juvenile prostitution ring; and a case in Philadelphia where a man was sentenced to life in prison for smuggling young immigrants into the U.S. and forcing them to work for little or no pay. Amtrak is doing their part as Front Line Identifiers. You can become an FLI as well. The DHS Blue Campaign created training and awareness materials to inform people of potential indicators of human trafficking and identify potential victims. Take just a few minutes to learn the indicators of human trafficking and how to report it to the proper authorities.